Waterbeds give you an uncomparably floating feeling during sleep. Stendebach is an absolut expert in high-quality waterbed-textiles and accessoires for different bed-constructions, allowing an even more sophisticated system. Our partners put trust in us for many years, appreciate our know-how in beddings and develop premium sleeping systems together with us. Starting with different water bed tubs, partly with integrated toppers, over sleeping-layer-overlays in a variation of models up to especially developed protectors and beddings like the cool touch collection a wide range of products is offered. For cases of emergency we have developed the easy and efficient repair-covers. 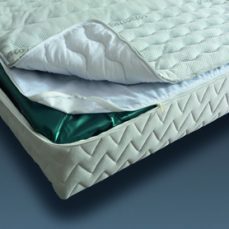 With this product in a wide range of variations covers can easily be replaced, without demounting and pumping down the complete bed. More details in German can be found in our waterbed-textile-catalogue in the downloads-area.